When most people think of the great Sherlock Holmes, we get 'the usual suspects': Brett, Rathbone, on occasion Livanov. We also get Cumberbatch foisted on us as a 'Great' Holmes, though I find him quite insufferable. Rarely mentioned in that conversation, however, is Christopher Plummer, which is a shame. Murder By Decree is the only Sherlock Holmes story Plummer starred in, and while it is not Canon and veers towards the outlandish in terms of plot, he does a remarkable job as The Great Detective and more than holds his own against the truly Great Versions. 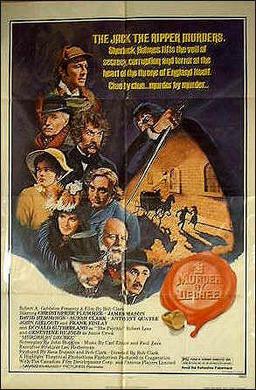 Holmes is called upon to investigate the Jack the Ripper murders, but not by the police, especially his frenemy Inspector Lestrade (Frank Finlay). Instead, it's a group of Whitechapel businessmen, irritated by what the crimes are doing to their business interests in this dilapidated part of London. Holmes right-hand man, Dr. Watson (James Mason) is not eager for his friend to get involved in this investigation, especially since it is so ghastly and ghoulish. Little does the good Doctor realize that such elements are the things that would intrigue Holmes. Holmes and Watson begin their investigation, but find that there are nefarious forces against them. Chief among them is Sir Charles Warren (Anthony Quayle), head of Scotland Yard who is dead-set against these amateurs getting into this case. His disdain is so great, as is his bungling of the case, that he deliberately destroys evidence: graffiti that blames 'the Juwes' for the crimes. This is a correct clue, but a misleading one. Holmes' esoteric knowledge of Freemasonry leads him to deduces that 'the Juwes' is not in reference to Jews, but to Masonic mythology. Also finding himself involved in this ugly business is Robert James Leeds (Donald Sutherland), a medium who has a sixth sense of who the actual killer is. Through his 'powers', Leeds does find the actual killer, but the police will not believe him. They in fact place him in unofficial house arrest, but Leeds' clues do lead Holmes to the truth as to why these poor unfortunate souls have been murdered. That trail leads him to Annie Crook (Genevieve Bujolds), who is locked up in an insane asylum. She carries a shocking secret involving her baby daughter and someone of high rank. Holmes, having uncovered the truth, now attempts to save Mary Kelly (Susan Clark), whom he came close to saving but who is the last to know Annie's shocking secret. Holmes is too late to save Mary from her gruesome fate, but thanks to him the actual killers are caught. However, those behind these Masonic/royalist plots are still free to keep their Satanic secrets under wraps. Holmes extracts from them a solemn oath that Annie or her child will not be harmed in exchange for his own silence, and while it is too late for Annie herself, the child is safe. Holmes looks back, partially in anger and partially in regret, into this sorry saga. Murder By Decree is a showcase for Plummer, with him giving a bravura performance in a film extremely well-filmed by Bob Clark. His final face-off against the three Masons behind these shocking crimes is a masterwork of monologue, balancing the righteous anger without being over-the-top. What is also strong about Plummer's performance is that he brings a surprising lightness and humor to Holmes. Plummer gives Holmes several moments where he rather wry and amused. Right from the start when he comments on the lateness of His Royal Highness the Prince of Wales and how that won't endear him to his subjects, we see that this Holmes is a man fully aware and not as removed from the world as perhaps other versions have been. From smashing a pea that Watson wants to corral to having a bit of a jolly about his 'killer scarf', Plummer finds humor in Holmes without making him a figure of fun. When he needs to be serious, he is. Plummer even brings a touch of emotion after his interview with Annie, a sense of sadness at her fate mixed with furious anger at how she has been mistreated by those in power. For all the good Plummer does, poor James Mason finds himself playing Watson in the Nigel Bruce version, that of a dithering idiot who could not find his way out of a room if all the windows and doors were opened and clearly marked. He seems perpetually flummoxed at everything, extremely prudish about the state of corpses despite being a doctor, and almost fanatically royal: Watson leads a cheer for HRH to try and stifle the angry boos from the commoners in the upper balcony who've been kept waiting for at least close to an hour. In short, Mason's Doctor Watson is a total square and nincompoop, so much so that you almost want him to be taken away by the Masons. John Hopkins' screenplay, however, does give him a strangely contradictory manner with the ladies. Holmes at one point muses about what a ladies' man Watson is, but when a tart attempts to seduce him, Watson seems downright Victorian virginal. Still, on occasion Mason does give Watson some sense: an attempt by that tart and her pimp to shake him down results in a right thrashing, even if Watson ends up getting arrested, much to Lestrade and Holmes' amusement. I found Quayle to be wildly fussy as Sir Charles, but in his defense that was how the character was written. Even though his part was small, Sutherland gives Robert the Medium a strange, otherworldly quality, a bit reminiscent of his performance in the Invasion of the Body Snatchers remake. Clark was extremely effective in his directing, bringing enough eeriness and Gothic horror to the killings without being graphic or giving away much. Clark focused on the killer's eyes and POV, putting in appropriately eerie music to the wild goings-on. It is a masterwork of showing just enough without giving away anything, pulling in the violence while still giving people a taste of the gruesome and macabre. Perhaps the Mason/Royal conspiracy bit was story-wise, extremely outlandish, and it seems like Murder By Decree has unleashed this oddball conspiracy theory on the world about the Jack the Ripper murders. However, that's a minor quibble in a well-crafted, entertaining film. Anchored by a brilliant performance from Christopher Plummer, with great work from Sutherland, Murder By Decree is a Sherlock Holmes film that all Holmesians should have in their collection.